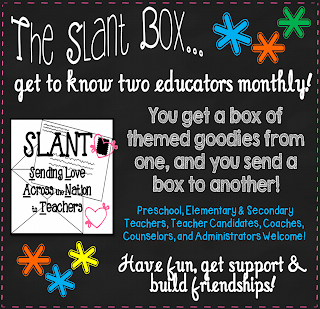 I signed up for the August SLANT Box, hosted by Jameson from Lessons with Coffee. I have seen posts on others' blogs or Instagram feed about SLANT Boxes, but hadn't participated myself. This months theme was "Hometown Pride". I stumbled across the signup page and figured "why not?" I'm so glad that I filled out the form! Through this process I have connected with two wonderful ladies and know we will keep in contact afterward. How great is that? Julie, from Laughing and Little Learners, is the person who I was matched with to send to. The rules state you need to send a handmade item as well. When I asked Julie about her classroom decor she said "owls and bold colours". But, she also said she had a lot of hand-me-down stuff from teacher friends. I decided that wouldn't do and made her a huge pack of decor items: desk plates, mini tags, student numbers, calendar numbers, days of the week, months, schedule cards, behaviour management system, table numbers.... so much more. I don't know if she'll use it all, and that's okay. I wanted to give her some pretty options. I used the same background and clipart that's on her blog, so I'm pretty sure she'll like the colour scheme anyhow. And now, on to my match to send to me, Sarah, from Juice Boxes and Glitter! Sarah teaches preschool students, and I honestly don't know how she does it. This girl seriously spoiled me! I'm not kidding, it's too much. Here is what she sent me! The first thing I saw in the box was her lovely handwritten card and every item wrapped up in tissue paper. When I removed that layer, I saw that every item had a little note on it. So cute! I told you she spoiled me! I am so moved by her thoughtfulness and kindness in this package. I know I've made a connection with someone that will last past the match up! I had such a positive experience with SLANT, that I know I will be signing up again. I didn't sign up for September, I figured I would wait a while. Maybe December? I bet that will be a fun one!